Should We Alter the Course of Nature in National Parks? Should We Alter the Course of Nature in Our National Parks? Our country’s national park system allows for the conservation of flora and fauna while also providing sanctuaries where people can visit and enjoy the splendor of Mother Nature’s handiwork. It’s a mutually beneficial arrangement that has operated for decades to both protect and educate. But national parks aren’t eternally self-sustaining regions. Sometimes climate change alters the face of a park and puts its wild inhabitants at risk. Sometimes we institute changes in an attempt of rebalancing the ecoysystem, like the wolves in Yellowstone. But is it really our job as caretakers to defend nature from itself or should we sit back and let it take its own course, instead? In Montana, Glacier National Park is going through some mighty big changes. Over the past 23 years, a study by the U.S. Geological Society has been measuring the decrease of glacial mass. In a USGS video posted on the National Geographic website, research ecologist Dan Fabre says that in just ten years’ time, the park’s glaciers will have mostly disappeared and what’s left might not be big enough to even deserve the name “glacier.” The change is pushing wildlife further north, altering their natural habitats and forcing them to adapt. Now, it’s important to remember that Glacier National Park wasn’t named because of the glaciers IN the park, but rather because of the glaciers that FORMED the park (learn more about Glacier’s history here). Still, that doesn’t change the fact that Glacier’s wildlife is changing at a rapid clip. Whether the change towards warmer weather is caused by greenhouse gases produced by us or just by the natural order of things, the people in charge have taken notice. Should we do anything to help? And how exactly can we? 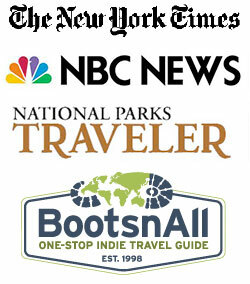 According to the New York Times, a fierce battle has been raging at Isle Royale between moose and wolves. In the early 1900’s, moose arrived on the Michigan island. In the 1940’s, wolves made their way south from Canada across an ice bridge. 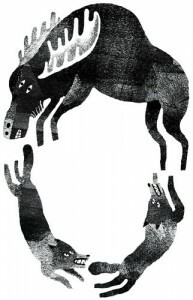 The moose population was large, due to a lack of predators; but wolves changed the balance, eating them with impunity. Back in the mid 1900s, wolves roamed back and forth from Canada to the island freely. However, due to Climate Change, the ice bridge is no more and the wolves are isolated on the island. This has resulted in inbreeding. The inbreeding has led to a sharp decline in the wolf population, causing alarm in the National Park Service. The question now is whether they should step in to protect the wolf. But isn’t that an intrusion of nature and her way of life? 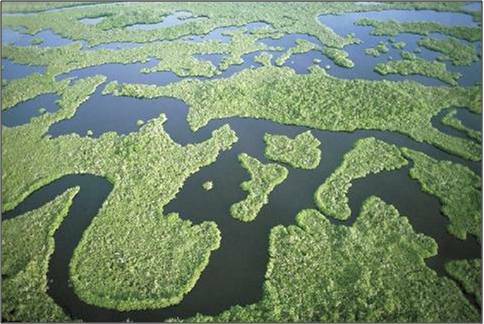 In Florida, the Comprehensive Everglades Restoration Plan is well underway, attempting to undo damage caused by construction and agriculture by humans over the past 100 years. Serious threats to the ecosystem came to light in the 1970’s when a proposal to build a jetport in the Big Cypress Swamp was revealed to be the potential cause of drastic destruction to the wilderness. Today, the state is continuing its valiant effort to restore the quality of water found in the Everglades to promote healthy growth of flora and fauna living in the area. What’s the difference between intruding on nature in the Everglades and stepping in for the wolves in Michigan? We have an obligation to restore the natural order of our parks if they’re suffering by our own hands. In Florida, people are cleaning up the messes they made. This isn’t the same situation as in Michigan. Up there, a decision will soon be made as to whether we should intrude on nature or not. In Glacier National Park, climate change is forcing the migration of animals, but they are adapting naturally. We can’t play God, especially with a park system that features “earth and its community of life…untrammeled by man, where man himself is a visitor who does not remain,” according to our own federal law. If we’re breaking it, we need to fix it. If we’re affecting climate change, we need to clean up our act. If we’re contaminating the water, we need to purify it. But if we think we have the right to separate moose and wolves like a referee at a boxing match, then we need to reexamine our historically-defined relationship with the wilderness of national parks. Great article! Heartbreaking to hear about the decreasing glacier masses…very sad. The power of humans to destroy our earth and living things is great. I enjoy reading articles like this one, that makes us more aware of our effects on the earth. Thanks Perry! I don’t think there is a perfect answer. I usually feel like the natural order of things should be left alone but when human interference causes big changes, it’s hard to not step in. How sad will it be to have no glaciers in Glacier National Park? We have to do what we can to slow down the processes that lead to their decline. The disappearing wolves in Isle Royale breaks my heart. Their population suffered a huge blow when a visitor arrived on a private boat with a dog infected with canine parvovirus. Combined with inbreeding, their population will not be able to be sustained. I can’t imagine Isle Royale without wolves and feel like they should be reintroduced. Without a predator, the moose population would suffer as well as there simply is not enough space and food for a population with unchecked growth. Hopefully the experts in the wolf project on Isle Royale will guide reintroduction if and when it takes place. It would be so sad to not have glaciers in Glacier. But remember: Glacier isn’t named Glacier National Park because of the existing glaciers, but rather because glaciers formed the park.